I've let so much time go by that the catching up problem has reached intimidating proportions ... which doesn't help me to address it. I've decided to do bits, and not aim for completeness. I've got some nice photos I'd like to post, and some stories (technical and aesthetic) which may be interesting, so I'll just stick them up as they occur to me. I had an interesting passage round Cape Wrath. The weather last summer was a bit lumpy (some of you may remember ...) so sailing was a bit more taxing than blissful. I sailed from Kinlochbervie early (before 4am), to pick up a favourable tide. I was plodding northwards in varying visibility, motoring much of the time. The wind was from the NE. About nine miles from CW, the charging light and warning buzzer came on. I hove to and switched off the engine to check the wiring. There didn't seem to be any loose contacts, or other simple explanations. There was some water in the starter battery box, but nowhere near the wiring - I sponged all of this out just in case. After spraying everything with WD 40 I restarted the engine. For a while, things seemed fine. I kept the revs a bit lower, to reduce boat motion. I wasn't sure how this might be relevant, but it felt a bit more comfortable, even though I was worrying about whether the tide would stay with me. After another restart, and another alarm, I realised I had a more serious, and apparently unrelated, problem - there was more water in the bilges than their should have been. In fact, it was not far under the floorboards, and was slopping over them as the boat rolled. Hove to again, with the engine off, I checked the boat from end to end looking for the leak. The ususal suspect - the heads sink outlet - was innocent. The seacock was safely closed. No explanation presented itself, and the water level didn't seem to be rising. I pumped it all out and had a think. I realised that the only safe course of action was to head back to Kinlochbervie and find the leak. I then tried one more thing, more on a hunch than because I had any real theory: I started the engine again and lifted the companionway steps out of the way while it was running. This time I could see that hose from the water pump to the cylinder head had punctured. With the pump pressurising it, it was spraying water onto the alternator belt, leading it to slip; and also filling the boat up with water. Either heat or wear had caused the puncture - not from current circumstances, but possibly because of a previous poor fitting that led to it rubbing on something. I stopped the engine again and taped the hose up well enough to get back to Kinlochbervie and replace it. 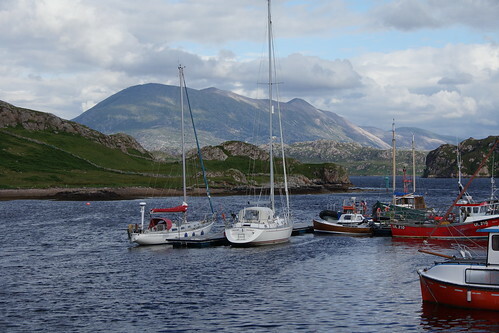 Later that day, I picked up the afternoon tide and made a fairly uneventful (though choppy) passage to Loch Eriboll.